A warm welcome awaits you at our delightful home one mile northwest of the Spa town of Llandrindod Wells. A warm welcome awaits you at our delightful home one mile northwest of the Spa town of Llandrindod Wells The accommodation offers two tastefully furnished ground floor bedrooms ensuite. One with bath/shower and one with walk in shower Colour TV’s, clock/radio and hospitality tray. ​The Dining room is situated upstairs with views of the surrounding hills. Close to the Llandrindod Wells Golf Club and many other key attractions around the area. 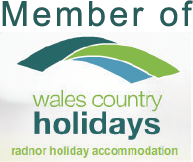 * Visit Wales grading 4 Star B and B. * Walkers and cyclist welcome.